DeeDee Bunn is a certified Speech-Language Pathologist (SLP) who specializes in augmentative communication and assistive technology. She has over 30 years experience working as a Speech-Language Pathologist and is the augmentative communication specialist for Tools for Life/AMAC at Georgia Tech, assisting individuals with speech/language and communication difficulties in finding communication systems to help them succeed in school, work and play. 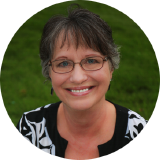 DeeDee has presented at numerous national, state and regional conferences on augmentative communication and assistive technology, with an emphasis on helping individuals increase their language, literacy and communication skills.